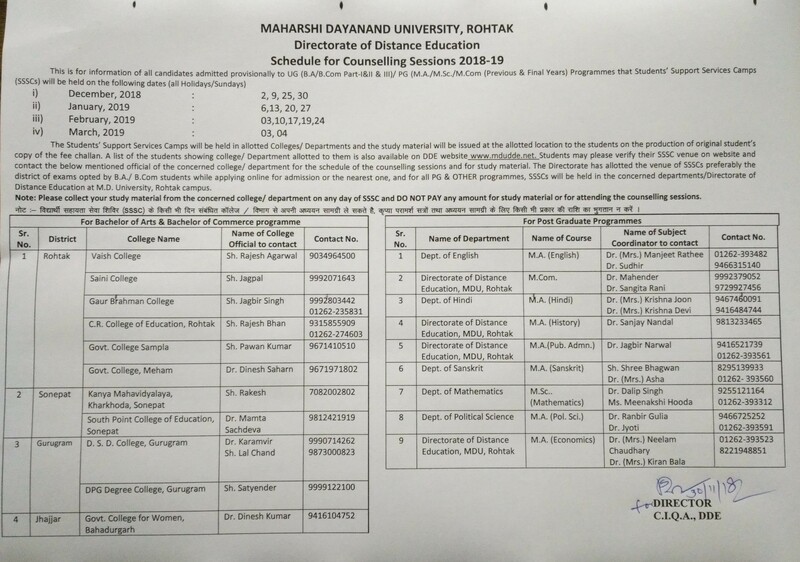 Maharshi Dayanand University Distance Education, Rohtak has Established a Correspondence Cell in the year 1988. It is dedicatedly imparting quality education through Correspondence courses. Since its inception, the university is tremendously evolved and developed. It has upgraded the Correspondence Cell to Directorate and has expanded tremendously. The Directorate is providing opportunities for higher education to a large segment of the population who are unable to join any regular courses due to myriad reasons. To get more details please visit the university website link. For the support, we are mention phone number (Below on the page), if you any types of requirement, you can contact at the number. Before filling the Online Application Form, Check the all Pop Up Notifications on the Official site. Interested candidates can apply for the admission process through an online application. For this, they have to visit the Maharishi Dayanand University official website. Firstly Login the Page and fill the Personal Details such as address, qualifications, course, upload required images and click on the Payment section. After the online form submission candidates have to submit Print Copy of the Admission Form along with all required documents to the Directorate of Distance Education. The complete details of the admission process are available online. Candidates are required to visit the website of MDU for applying online. Pay the Courses Fee through the Challan. Candidate can log in the Student portal with the help of Student number and Password and Not them for future reference. University provides the Student’s Support Services Camps. Students can collect the study material from the concerned college/ Department on any day of SSSC. A student did not have to pay the fee/ amount for Study material or for attending the Counselling Session. Candidate can fill the form through the Computer, not on Mobile. For Best services, Fill the Application Form on Google Chrome. Postal Address – Directorate of Distance Education, Maharshi Dayanand University, Rohtak-124001, Haryana, India.